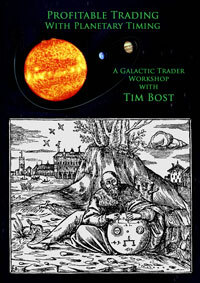 In this powerful two-day workshop, renowned market astrologer Tim Bost presents advanced astro-trading techniques that open the door to more profitable results for every trader. As the editor of Financial Cycles Weekly newsletter, Bost brings decades of market experience and geocosmic insight to his lively instructional sessions. As you watch the DVDs recorded live at this remarkable event, you'll get state-of-the-art, ready-to-use tools and techniques for capitalizing on planetary energies, timing your trades more effectively, and discovering the amazing potential of hidden market structures through the Law of Vibration. Along the way, Tim Bost reveals the easiest and most dynamic ways to get the best from the Fibonacci Trader/Galactic Trader software developed by Robert Krausz and Jeanne Long. You'll learn about the Universal Clock, planetary price lines, astrological time bands, the power of planetary harmonics, and much, much more. The complete Profitable Trading With Planetary Timing Workbook (in PDF format) — the same workbook that was provided to the workshop attendees! Fibonacci Trader/Galactic Trader software — a fully functional trial version of the software used in the workshop. In this six-volume DVD series, Tim Bost takes you step-by-step through the complete process of creating and executing a comprehensive astro-trading plan. In these 12 complete lessons, you'll grab cutting-edge trading and analysis tips as well as answers to the top questions asked by some of the top astro-traders of today.